Happy Saturday to you all. As many of you know I announced the Top Commenter for 2014 a few weeks back. With Corbin being here and being sick I'm just now getting around to getting something made for her (Lisa). I had several things in mind. 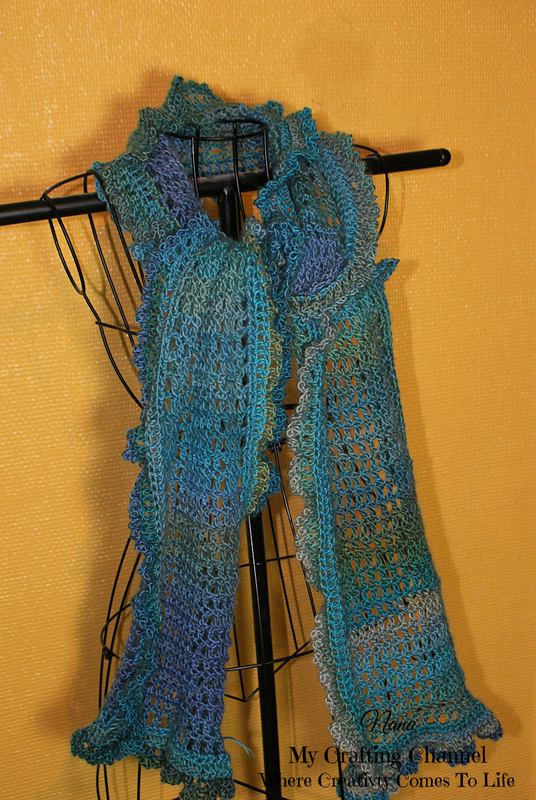 However, after getting out my crochet hooks and watching some YouTube videos I ran across this gorgeous lacy, frilly scarf and fell in love with it. I thought the colors were perfect for her. It has all the colors she uses most of the time in her cards, she love Mermaids and these colors reminds me of the sea. So I made it using the same colors as Melanie from IHeartStitcing. Here is a Link to her video with step by step instructions. I did not want to post the scarf until Lisa received it. It was delivered today. Lisa I sure hope you enjoy your scarf and would love to see a pic of you wearing it. Hint Hint!! I just LOVE the gorgeous lacy scarf!!!! You did a wonderful job, it's just beautiful! I know Lisa will love it! WOW! Its Gorgeous!! She will love it!! Congrats Lisa!! Wow, that is a very nice looking scarf! AWESOME project and I bet Lisa flipped when she received this! This scarf is BEAUTIFUL!!!!! Lisa will love this!!!! Congrats to Lisa!!!! Have a great day. Beautiful! What gorgeous colors - Lisa is going to love this I'm sure! Congrats Lisa - let's see that photo! absolutely gorgeous, love the colors, and I know it will be perfect for Lisa!! So so gorgeous!!!! Absolutely stunning!!!! So gorgeous - what a fabulous gift. Congrats to Lisa! oh my Nana, this is absolutely gorgeous!! love this ruffle stitch!